Senior Carter Doherty attacks the inside as he finished with 10 points in the Trojans 59-54 loss to Anderson County. 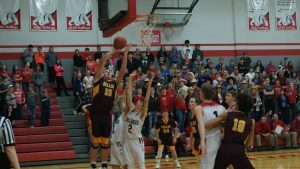 After sweeping the Galena Bulldogs, the Girard Trojans made their way to Anderson County to compete against the tough, gritty Bulldogs, Feb. 1. Following the Lady Trojans last matchup, Girard (11-2) defeated Galena 49-29, maintaining their undefeated CNC streak. Friday, Anderson County (3-8) gave the Lady Trojans a run for their money as the Bulldogs came prepared to play. Senior Drake Worrell became the focal point of the offense in the first quarter scoring 9 of the Trojan’s 18 points. Anderson County’s inability to execute off easy baskets would give the Lady Trojans a comfortable lead heading into the second. Freshman Faith Poland began to get the inside looks she’s accustomed to as Girard continued to push their comfortable lead. The game slowed down considerably in the second quarter as the full-court pressure from both teams made baskets come at a premium. Sophomore Jaada Valley would get in foul trouble before the half, but that didn’t delay the Trojan’s efforts as they led 31-23 at halftime. Valley yet again got into foul trouble early in the third quarter and would not return until five minutes left in the game. This proved to be a key loss as the Bulldogs aggressively attacked the Lady Trojans on defense causing turnovers and getting easy baskets inside. The Anderson County Bulldogs captured a 10-1 run to start the third, taking the lead for the first time in the game. Poland continued to bring needed energy for a rattled Trojans team getting her inside baskets. Poland later left the game with an apparent knee injury. With momentum swinging the Bulldogs way, Valley returned to the game as her efforts helped Girard stay neck and neck with Anderson County coming down to the final minutes. Anderson County would make a go-ahead layup with 24 seconds left putting the Bulldogs up by two giving Girard an opportunity to win or tie the game. Senior Kalyn Flaharty put up a shot that would roll around the rim then pop out as the Lady Trojans (11-3) fell 58-56 to the Bulldogs (4-8). “When everybody in the room is losing their head, you have to keep your cool and there were lots of times we can point to where we probably didn’t,” said Coach Brad Herlocker. Despite the injury, Poland led the game in scoring with 16 points for the Trojans, including going 6-7 from the free throw line. Worrell finished in double-digits as well ending her night with 12 points and 9 of those coming in the first. For the boys, they come off an easy, convincing 46-21 win over the Galena Bulldogs. Friday, the Trojans (12-1) faced the Anderson County Bulldogs (8-4) in what would result to be an offensive shootout. Girard came into the game with an obvious size advantage as senior Carter Doherty took advantage of the mismatch scoring the Trojan’s first 6 points. The Bulldogs held the ball for a considerable amount of time as their ability to find open looks would give the Trojans troubles. The perimeter game from the Bulldogs kept Anderson County hanging on close to the Trojans in the first half. But Girard’s ability to take advantage of mismatches would give the Trojans a 24-23 lead at the half. Senior Caleb Muia started to heat up in the second half scoring Girard’s first 9 points to start the third. The inside attack of Muia and Doherty would push Girard to double-digits midway through, but the Bulldogs weren’t done just yet. 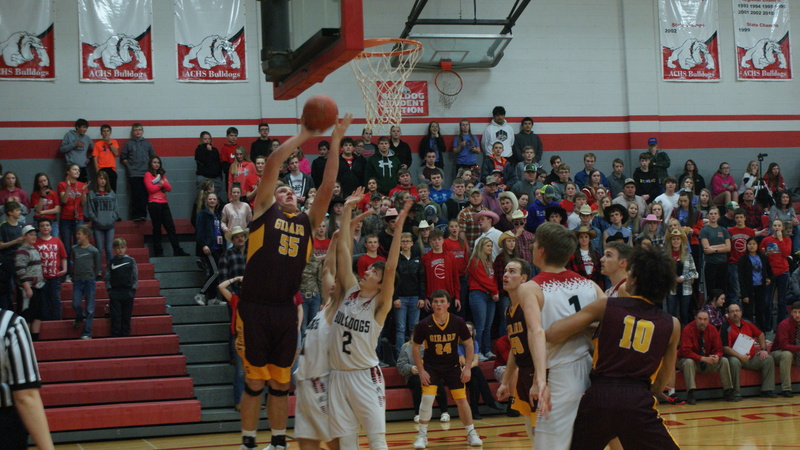 A team that lives and dies by the three, the Bulldogs were thriving as they minimized Girard’s double-digit lead and brought their team within two at the end of the third. It would become a back and forth battle between both teams. A three from senior Dillon Collins put the Trojans up by four with two minutes left. But with the hot outside shooting of the Bulldogs, they would make a three bringing the game to within one point. A jump ball on the next possession gave the Bulldogs the ball back with 36 seconds left. Anderson County took advantage the Girard’s mistake going up by one then stealing the ball from Girard following and making it a three-point game. An illegal screen from the Trojans ultimately sealed the game as Anderson County (9-4) defeated the Girard Trojans (12-2) 59-54. Senior Caleb Muia piled on the points Friday night as he finished with 35 points for the Trojans. Carter Doherty’s inside effort helped him finish in double-digits as well as he ended his night with 10 points for the Trojans. The Trojans will travel for their next matchup Tuesday, Feb. 5, against the Columbus Titans in a rematch from Jan. 4.